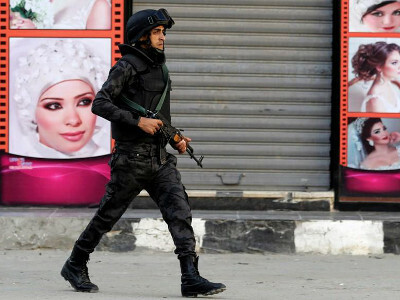 Egyptian police killed two gunmen who carried out last month’s attack on a bus carrying Christians in Minya governorate south of Cairo, the interior ministry said. Police, helped by the military, found the gunmen in Assiut governorate, south of Minya, it said in a statement. They had three automatic rifles, a shotgun and an unspecified amount of ammunition. Security forces also found one vehicle used in the November 2 attack, which killed at least seven Christians returning from a baptism at a Coptic monastery. The mobile phone of victim, Kamal Yousef Shehata, was found, the ministry said. On Novembdr 3, a day after the attack near the Monastery of St Samuel the Confessor in Minya, security forces killed 19 militants suspected of involvement. Islamic State claimed responsibility for last month’s attack, which took place at the same spot as a May 2017 attack that killed 28 Christians. Islamic State claimed responsibility for that attack.